Here’s a good tasty winter dish for those of you who can still face cooking after all the Christmas entertaining. Indeed if you still have some entertaining to do this is a great prepare ahead recipe which all cooks in one dish so no need for separate sides other than some steamed greens. We did not prepare ahead and so our guests ended up eating rather late…hopefully they felt it was worth the wait! Don’t be put off by the long list of instructions and ingredients – it’s all very straightforward and you will probably have most of the ingredients in the cupboard already. Toss the beef in the flour, then brown half in a pan, using 1 tbsp oil. Remove to a bowl when browned. Add 100ml wine to the pan and scrape all the sticky bits off the bottom of the pan. Reduce a little before pouring over the cooked beef. Wipe the pan and repeat with the rest of the beef and another 100ml wine. Finely chop the onions, carrots and garlic in a food processor. Add 2 tbsp oil to the pan and tip in the chopped veg, peppers, fresh chilli, thyme sprigs and bay. Fry for 10 mins. Tip in the spices, cook for 1 min, then add the rest of the wine and reduce by half. Add the tomatoes, sugar, beef, winey juices and stock, season, then simmer for 1 1/2 – 2 hrs until the meat is really soft. Stir in the beans and allow to cool. Peel and slice the potatoes about 5mm thick, then boil for 5 mins. Drain, then tip back into the pan. Add the butter and thyme leaves, season, then toss to coat (be gentle so you don’t break them up too much). Tip the chilli into a big dish, then layer the potatoes on top. Dot with butter. You can now leave it and bake it later on or heat the oven to 200C/180C fan/gas 6 and bake for 50 mins – 1 hr, until the sauce is bubbling and potatoes golden. 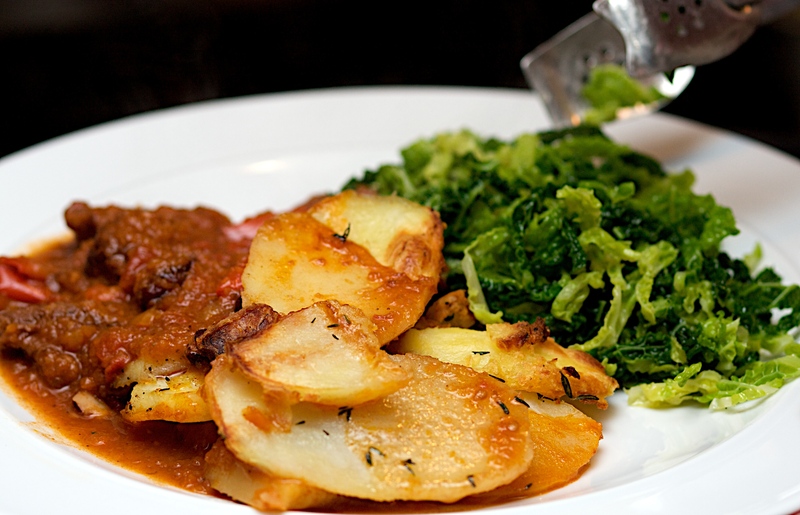 We served this with buttered savoy cabbage – you could also have some soured cream if you like. Find the original recipe on the BBC Good Food Website. The guests happened to be Julie’s Mum & Dad and we thoroughly enjoyed this dish – yum. Hi Julie, Joanne here. Hope you and Jono are having a lovely first married Christmas! Last minute New Year’s Eve panic as usual and I though of you. Have some lovely stewing beef and looking for a nice dish to go with rice (I’m making a chicken dish as well). Do you think the hotpot would work without the potato topping on its own with rice?